Admin edit: The following posts were moved from the main Current Conditions thread. January 2012 is starting out with the least amount of snow ever recorded at this point in the winter. 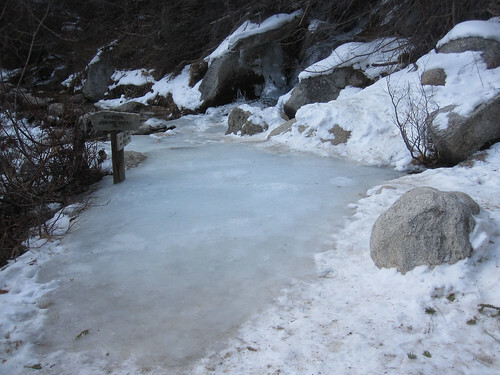 While that bodes ill for future water needs, it provides some unusual winter hiking opportunities. Until the next winter storm arrives, there are only inches of snow on the trails, so hiking for the adventurous is possible. 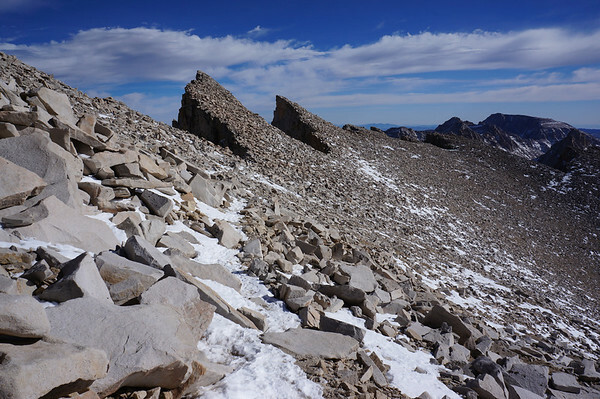 Snow shoes can be left behind, but some places are icy, so crampons and microspikes are useful. With the incoming weather, I have decided that if I don't get my winter hike in tomorrow, it ain't going to happen for a few months. I'm going to head up tonight or early in the morning and do a dayhike. My goal is trail camp. but I don't foresee needing the cramps and ice axe. I'd have to make it to trail camp real early for me to go for trail crest (not even going entertain a bid for the summit). I'll take pix, but I suspect that after Friday, they will be useless for trail conditions. were you able to drive to the portal? Im headed up the MR Friday the 27th.. how much snow did we get last weekend? I was able to drive to the portal with no problem. However, as predicted, my intel would have little relevance after the incoming storm hit. I haven't heard anything about road conditions since the storm(s) hit, so I can't offer meaningful input at this point. But, I would assume that we are now officially in winter conditions on the road and on the trail and that you go past the "road closed" sign at your own risk. How were you able to drive to the Portal? I thought it was closed by a locked gate. There is no gate. Just a "road closed" sign and a small barrier that is easy to drive around. Jeff, last year they put a really big rock on the road...that you could still get around, along the Road Closed barrier. It has to be the most ignored sign in North America. If you go up there, you have to be aware rock fall alter condition of your vehicle or your ability to drive where you want until sometime in late April. I've been up there in winter/spring conditions more the summer than 4 or 5 years. I find much more enjoyable. and have just a few questions. One, I know this winter has been one of the driest ever. 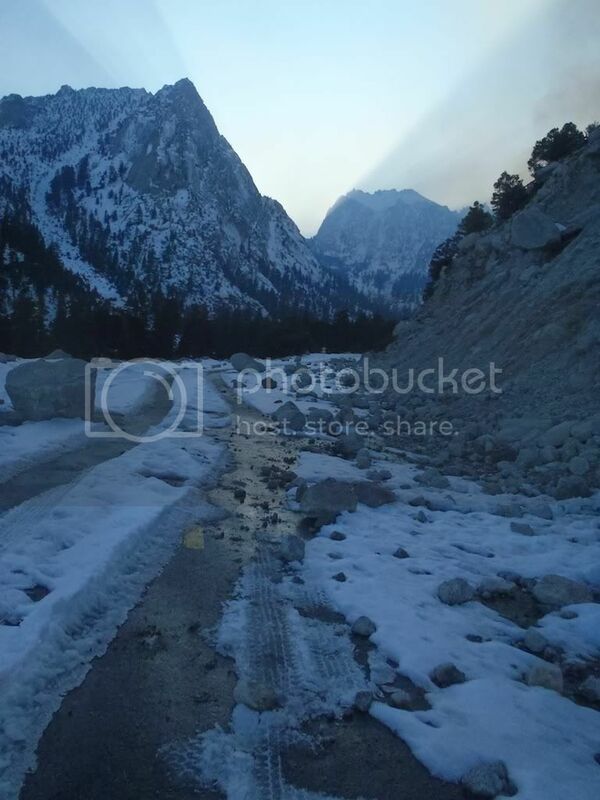 This being said, is the Whitney Portal road covered with snow? I know a sign says it's closed but if it isn't snow covered I plan to drive it. Two, we will be ascending the Mountaineers route starting from where we park Saturday the 18th and just wanted to get some insight on which is safer/better above the notch this time of year: The traverse to the west option or heading directly up the slope to the south. We will be having all climbing gear including ropes, screws, pickets, axes, crampons etc. Third, on the approach, are the ledges extremely narrow to the point that would require protection from any ice? Or are they 10+ feet wide? 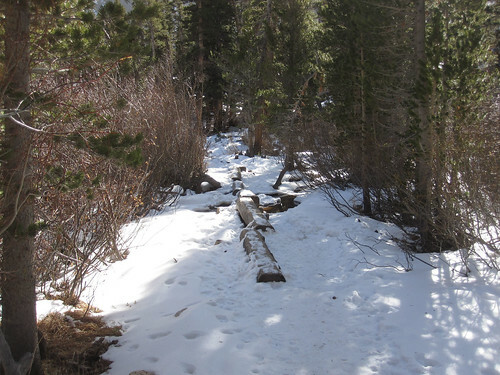 Also, will snowshoes be needed on the approach or is there not enough snow? Our plan is to get to Iceberg Lake the first day, climb Whitney and traverse to Muir and back to Iceberg Lake the second and return the third. Possibly climb Manly Bacon on our way back to Colorado. As long as a giant storm doesn't roll in within the next couple weeks we are a go. If someone could help out with my questions based on current conditions that would be greatly appreciated. 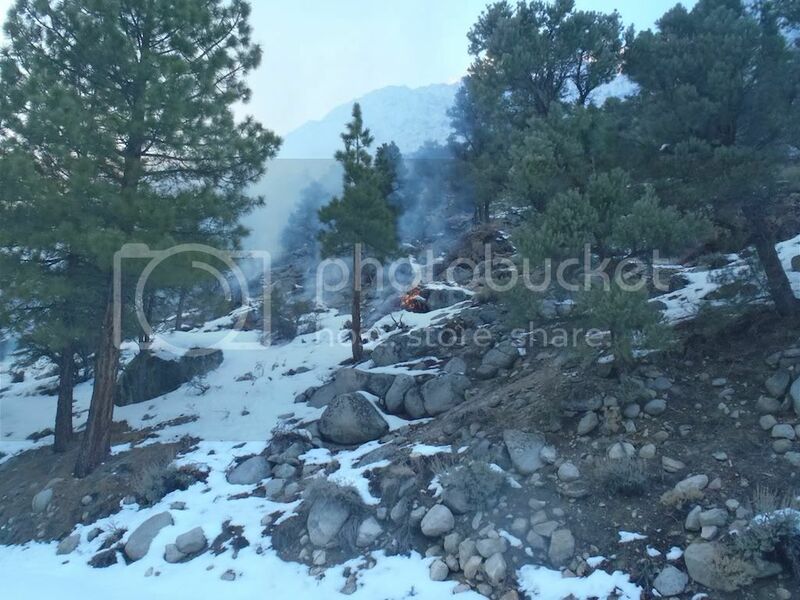 Forest service has been burning stockpiled wood the past several weeks up in the Portal area, as recently as yesterday (Feb 6), so some vehicles are making it up there. Caption: Mt. Whitney from where I parked at the lower campground gate. I can't find the picture now, but some weeks ago someone posted a picture of some rocks, one the size of a wheelbarrow on the road, with vehicle tracks running past. With the burning at the Portal, those may have been cleared. If you go past the Road Closed sign, be wary of incoming weather (vehicles get stuck up there). 4wd would get you farther up. As for the area above the Notch, I believe people go up the first chute. In the winter, the professional guides set protection up the chute for their clients. Below the notch is not as exposed. Regarding the Ebersbacher Ledges: In most winters, people can climb directly up over the snow, skipping the Ledges completely. This year the snow may not be heavy enough to cover the brush, so Ledges would be easier. You'll need to be the judge. You can find links to pictures and videos of the ledges in summer in the Mountaineers Route info post. I think I'd want to be wearing my crampons on the Ledges in winter. Not sure about snow shoes ...Cottonwood Lakes snow depth guage (See the Mt Whitney Weather link to the left) shows ~24" at 10,000' elevation. You could always carry them part way then decide to off-load them until you come back down. Holy Cow thanks so much for filming all those videos! Nothing looked bad at all. As for the road, as long as no storms come in I'll be able to easily drive that. "I can't find the picture now, but some weeks ago someone posted a picture of some rocks, one the size of a wheelbarrow on the road, with vehicle tracks running past. With the burning at the Portal, those may have been cleared. If you go past the Road Closed sign, be wary of incoming weather (vehicles get stuck up there). 4wd would get you farther up." Is the door on the shelter at the summit fixed??? 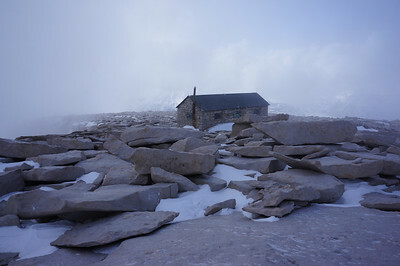 With the door off, more snow blows into the hut each storm, until it is nearly full. It will take until mid-summer for it to melt out, so the hut can be used as a shelter again. Richard P climbed to the summit via the Main Trail "route" on Feb 11. 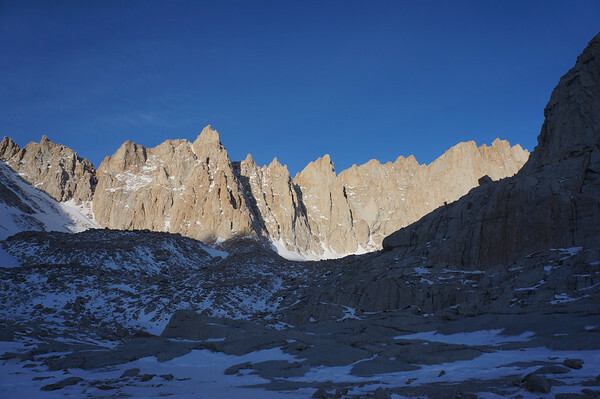 Climbing Whitney via Mountaineers route this weekend 24th/25th and was wondering if snowshoes were necessary on the approach. GoSlow: after your trip, I'd be interested in hearing about snow conditions above 14000 feet. I'm heading up the MR on March 1-4 with some friends, and we're trying to figure out what gear to bring along (besides ice axe and crampons). Conditions this past weekend were perfect even with the high wind advisory. 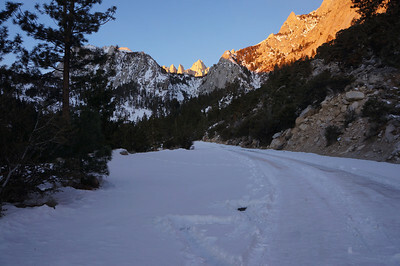 Will need 4wd or at least chains to get to the trail head for some segments of Whitney Portal Road. Snowshoes will be needed on the approach for much of the snow is unconsolidated. Crampons/Ice Axe needed as well. Cannot get water at UBSL so bring sufficient fuel to melt snow. Took us 6.5hrs to get to Iceberg Lake where we camped and then 9hrs to Summit and descend back to the trail head. GoSlow, thanks for the update. Above the Notch, did you bring any extra gear, or just ice axe and crampons? No, just snacks and water. Generated in 1.100 seconds in which 1.087 seconds were spent on a total of 15 queries. Zlib compression disabled.